The subproject ‘Ostian marble roof tiles‘ is now completely updated with the newest pictures and two added types of coppi. The subproject “Ostian Marble Roof tiles – a typology” has been updated, and will be further updated in the coming days. It involves addition of two new types and new pictures. News about OFP’s future & the “Förderverein”: Support the ‘Ostian (Forum) Society’! For the logistic and financial support of OFP’s research, we have founded a new association named: „Ostia-Forumprojekt. Förderverein zur archäologischen Erforschung Ostias / Society for the Promotion of Research in Ostia”. This association will be dedicated to the support of actual research by students and scientists with the long-term aim of a major final publication and innovative ways of presenting cultural heritage. For the next years our association will be focussed on supporting the Forum-research and its publication: What we plan to do the next years is basically the subsequent work-up and interpretation of all our excavation data from 2010 to 2012, of our supplementing surface-survey data until 2014, and of our finds so far (coins, ceramics, small finds like glas, bronze, bone artefacts and up to all kinds of marble objects, inscriptions and large finds). We hope to be able to continue our cooperation with the Superintendency of Rome and Ostia and the direction of the ‘Scavi di Ostia’ (Prof. Cinzia Morelli) and the finds deposits (Prof. Paola Germoni) for these fundamental aims to be as successful as in the last year. 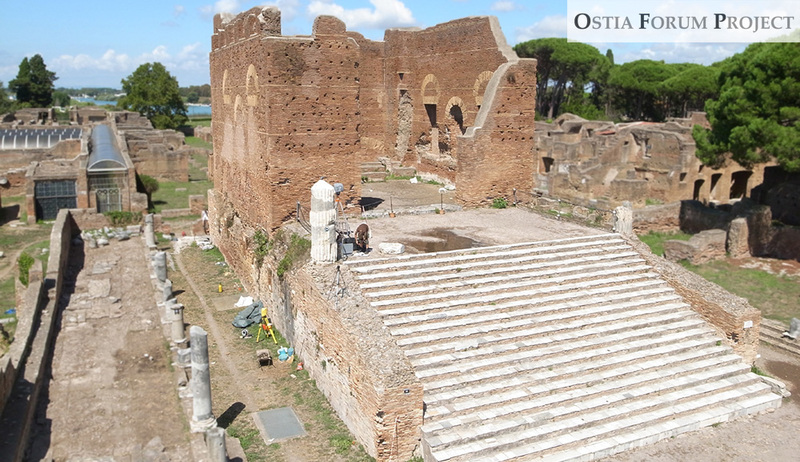 If you are interested in knowing what we plan to do on site in Ostia and back home in university in the next year(s), see “2015 A view back & plans for the future“: 7 major project-areas (subdivided for BA-, MA- and PhD-theses) cover almost 1000 years of Forum history in the center of the world’s largest excavated site! 2014 campaign: Sub-chapters 3 and 4 are online now! Follow the progresses of our research from late-antique marble-reuse to early-imperial pediment sculptures! Check the events & results of the OFP-Team’s 2014 campaign! For the 2014 campaign see: “2014 campaign: From a late marble-pile to Augustean Temple-pediments“. 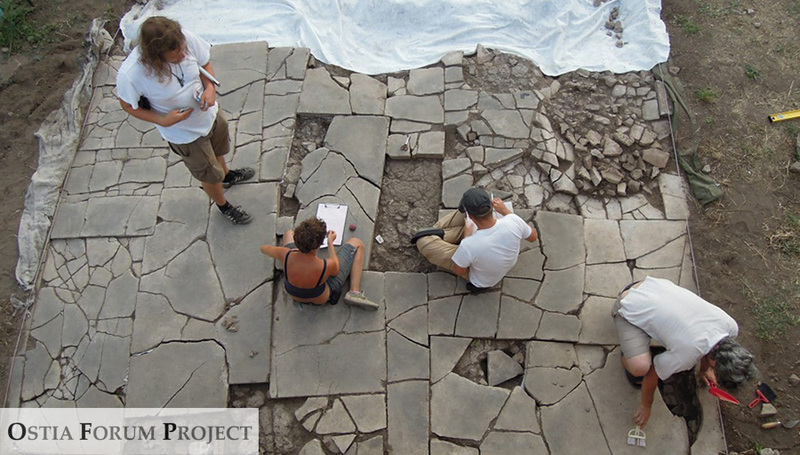 Sub-chapter 1 is online now: You can follow the first two weeks of our excavation! The subproject Ostian Marble Roof tiles – a typology has been updated with the newest research. Mittwoch/ Wednesday 7. 1. 2015 19.00 c.t. The university has started its winter-term and all the team-members are back from the field campaign 2014. This year we have documented a large pile of marble fragments in one of the rooms south of MFD with laser-scanners and the newest 3-D-camera-system used by the German Aerospace. Due to the high number of half-worked fragments and “exercise-pieces” we believe this could have been a rubbish dump of an artisans’ workshop nearby, probably the one we have found in the campaign 2013. A detailled quantitative and qualitative analysis of all marble pieces will be the focus for our next years campaign. Many fragments come doubtless from the Roma- and Augustustemple, some of them are previously unknown, like parts of the pediment sculpture. Other fragments were parts of sculptures, statue-bases, sarcophagus, reliefs or architectural decoration of demolished buildings surrounding the south end of the Forum. By the stratigraphical information we suppose it could have been a deposit with a TPQ of the middle of the 5th century AD. 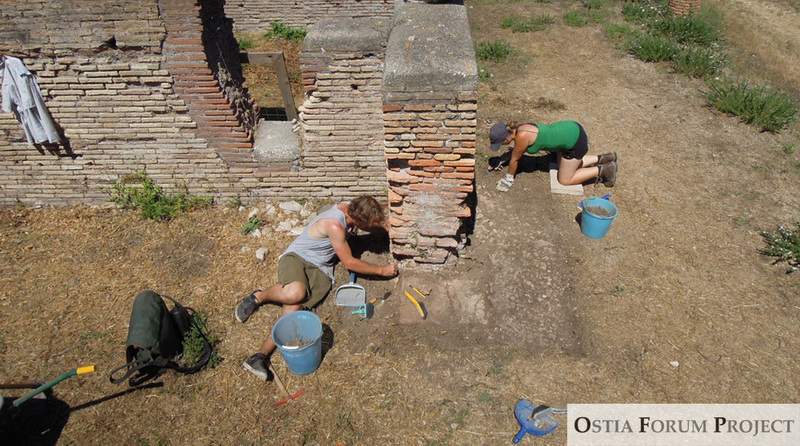 A new report will summarize our finds and their significance for reconstructing the final phases of Ostia soon! These sections are now updated with all new information regarding “Post-excavation Work“, “Our agenda for the final publication“, “Discuss with us: Level-raises” and “3-D-Visualization“. Here it is possible to examine 3-D-models of selected areas. Furthermore, we have explained “Why do we use laserscans?” and “Future perspectives of 3-D-works“. The lecture of the 28. of May 2014 at the Humboldt University, where Axel Gering spoke about “Ein Forum ohne Ende? Ergebnisse und Perspektiven der Ausgrabungen des Ostia-Forum-Projekts (OFP) 2010-2013” will be summarized in the section “Public Presentations” under “University” soon. New research on the visibility of statues in the last phases of the Forum in the 5th and early 6th centuries, and regarding the cultic continuity in the Forum area in the 5th century, will be presented in separate sections of this webpage and in the forthcoming book of Axel Gering: Ostias vergessene Spätantike. Die urbanistische Deutung grosser Flächenausgrabungen in Palilia 31. The presentation, Ostian Marble Roof Tiles and the urban impact, from the 5. of June 2014 by Daniel Damgaard, will be presented in the forthcoming article in Romische Mitteilungen and as a summary in the section “Public Presentations” under “University“. Furthermore, the subproject “Ostian Marble Roof Tiles” will be updated soon with new aspects. A presentation of Ostia-related research of Axel Gering in Hannover, the 25.-28. 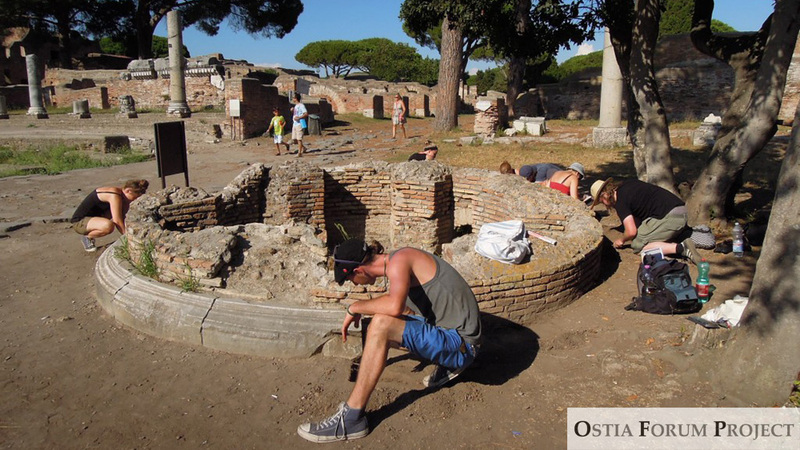 June 2014 with the title: “Ostia: Veränderte Stadtwahrnehmung zwischen Hoher und Später Kaiserzeit” in the Kolloquium: “Stadtwahrnehmung als Sinneswahrnehmung in der Römischen Kaiserzeit”, organized by Prof. Annette Haug (Institut für Klassische Altertumskunde der CAU Kiel, Klassische Archäologie) and Dr. Patric Alexander Kreuz (Institut für Archäologische Wissenschaften der Ruhr-Universität Bochum), sponsored by Volkswagen-Stiftung, will be published at the end of this year. The sections “About the Relevance: Some examples“, “Small-finds & their significance“, “Inscriptions” and “Large Finds” have been updated!